In the busyness and turbulence of modern daily life, stress is a common experience. Many of our problems, including ill health, are caused or aggravated by stress. Even though it may not seem to be true, much of the stress we experience comes not from external conditions, but from our minds. There is a simple solution to the chronic problems caused by stress: reduce stress by changing our state of mind. Simple breathing meditation, although only a preliminary stage of meditation, can have powerful effects. Just by minimizing distracting and disturbing thoughts with breathing meditation practice, it is possible to experience inner peace and contentment without having to depend upon changing external conditions. The feelings of contentment and well-being that arise from inner peace help us to cope with the stress and difficulties of daily life. Just by doing breathing meditation for ten or fifteen minutes each day, we’ll be able to reduce stress, thereby experiencing deeper contentment, better health, and more satisfaction in relationships. The class on Thursday evenings (January 25th through February 22nd) will explain how to begin and make progress with the practice of meditation, so that we can more effectively deal with the stresses of modern busy life. Through attending this class over several weeks, participants have a wonderful opportunity to develop a new meditation habit. Apply practical methods in our daily life to reduce our anger, and finally to prevent it from arising at all. Anger blocks our spiritual progress and prevents us from accomplishing any spiritual goals we have set for ourselves – from merely improving our mind, up to full enlightenment. The opponent to anger is patient acceptance, and, if we are seriously interested in progressing along the spiritual path, there is no practice more important than this. Patient acceptance is often thought to be a weak and passive response to problems we have neither the power nor the courage to solve. In reality, however, being patient is far from being passive. Patience is a mind that is able to accept, fully and happily, whatever occurs. It is much more than just gritting our teeth and putting up with things. If we truly understand the value of patience, we’ll never resent an opportunity to practice patience in daily life. Even if we never find the opportunity to study and meditate, but we truly learn to practice patient acceptance every moment of every day, we will make vast progress on the path to enlightenment. On the other hand, if we spend our entire life studying and meditating, but never practice patience, our spiritual practice will remain superficial and inauthentic. The class on Saturday, March 10th will explore easy-to-practice meditations to overcome anger and frustration with a mind of patient acceptance. 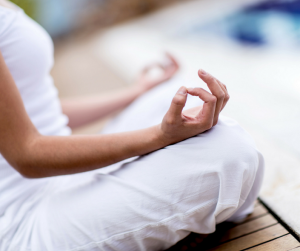 Experience meditation and its benefits. 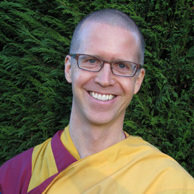 Gen Kelsang Khedrub, a western Buddhist monk for over 20 years, is the Resident Teacher at Kadampa Meditation Center Washington, a Buddhist temple in Ballard. Having taught several sold-out classes at Bellevue College in the past year, he will be teaching two classes in this winter term – a weekly Thursday evening class and a Saturday workshop. Meditation: Dealing with Stress and Anxiety. Item #8969. Thursdays, 7:00-8:30pm from January 25 – February 22 (4 weeks – no class on Feb 8). Click here for more information or registration. Meditation: Overcoming Anger and Frustration. Item #8970. Saturday, March 10. 9:30am-12:30pm. Click here for more information or registration.